Spider-Man: Homecoming is set to achieve what no Spider-Man movie has been able to create before: synergy with the Marvel Cinematic Universe. While everyone's favorite web-slinger will exist under Sony's control, his universe will intersect with the narrative of the Avengers when Tom Holland makes his on-screen debut as Spider-Man in next month's Captain America: Civil War. 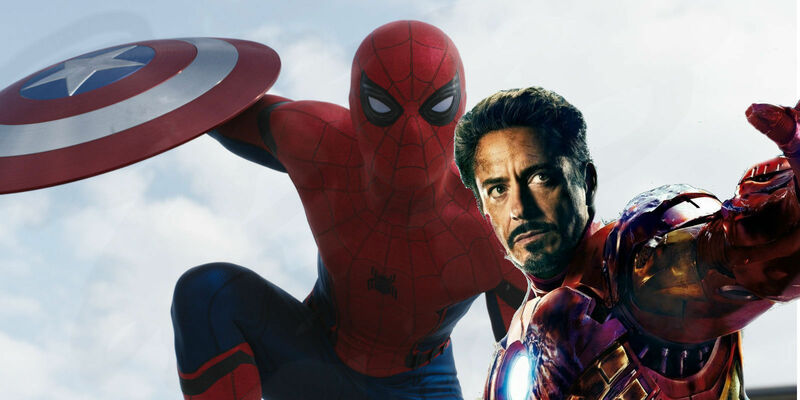 After Marvel's Kevin Feige teased the idea of the MCU heroes joining Spider-Man in his own film, fans have been searching for answers - and now, after being questioned about it recently on Jimmy Kimmel Live!, it seems as though actor Robert Downey Jr will be heading out to the boroughs to visit Peter Parker in Homecoming. While Marvel Studios has yet to confirm the news, sources closet to THR say that after several rounds of negotiations, Robert Downey Jr. will be joining the cast of Spider-Man: Homecoming. While it's not yet known how Iron Man and Spider-Man connect, the general assumption is that Stark is mentoring the young Peter Parker, and their quick exchange in the trailer for Civil War already shows a practiced team effort. Downey joins recent additions Tony Revolori (The Grand Budapest Hotel) and Laura Harrier (One Life to Live) as one of the few "adults" on the mostly young and diverse cast. Overseeing the action of Homecoming will be the dual-minds of Marvel's Kevin Feige and Sony's Amy Pascal, alongside director Jon Watts (Cop Car). Actor Michael Keaton, on the other hand, has formally passed on a role in Spider-Man: Homecoming, according to sources close to Deadline. The actor was reportedly in talks to play the film's villain, but apparently those early negotiations fell through and Keaton has now backed out of the project. Much remains unclear about Downey's involvement, including the what capacity he'll appear in, and if we'll don the Iron Man armor in the film. Homecoming will reportedly not be an origin story (in order to avoid re-hashing the plot beats of both Sam Raimi's Spider-Man and Marc Webb's Amazing Spider-Man) and as such, Spider-Man's initial mentor -- his uncle, Ben -- may already be long dead. Cue Tony Stark, who has taken Spider-Man under his wing in the comics before and even inspired a recent iteration of Peter Parker who was nearly the spitting image of Stark, with some minor (but major) differences. Downey is set to continue playing the role of Tony Stark through the end of Avengers: Infinity War Part 2. It's likely that Downey won't be the only Marvel hero to join the project, but that remains to be seen. With Spider-Man and the Avengers existing within the same canonical universe (one assumes), the success of this third go at Spider-Man on the big screen could determine how the studios work together on story for future films -- and just how broadly the characters of Spider-Man's Sony universe can extend into that of Marvel's. Downey's involvement and Iron Man's relation to Spider-Man can heavily affect where the two characters (one already a power-hitter in the MCU, and the other with enough household name recognition to lead a franchise again) go - and what that means for their shared universes. Captain America: Civil War will release on May 6, 2016, followed by Doctor Strange– November 4, 2016; Guardians of the Galaxy 2 – May 5, 2017; Spider-Man: Homecoming – July 7, 2017; Thor: Ragnarok – November 3, 2017; Black Panther – February 16, 2018; The Avengers: Infinity War Part 1 –May 4, 2018; Ant-Man and the Wasp – July 6, 2018; Captain Marvel – March 8, 2019; The Avengers: Infinity War Part 2 – May 3, 2019; Inhumans –July 12, 2019; and as-yet untitled Marvel movies on May 1, July 10 and November 6, 2020.